Acrylic and Metallic Acrylics on Gallery Wrapped Canvas. I began WHERE FAIRIES PLAY at the same time as FAIRY WHISPERS. I wanted to try moving the series to a larger format to see what would happen. Would the finger painting marks create “fairies” or would it move the painting an entirely different way. While there are still fairies in this painting, they aren’t as obvious as in FAIRY WHISPERS. Instead, Where Fairies Play became more of an intuitive painting where markings in paint, transformed into a magical fairy garden. 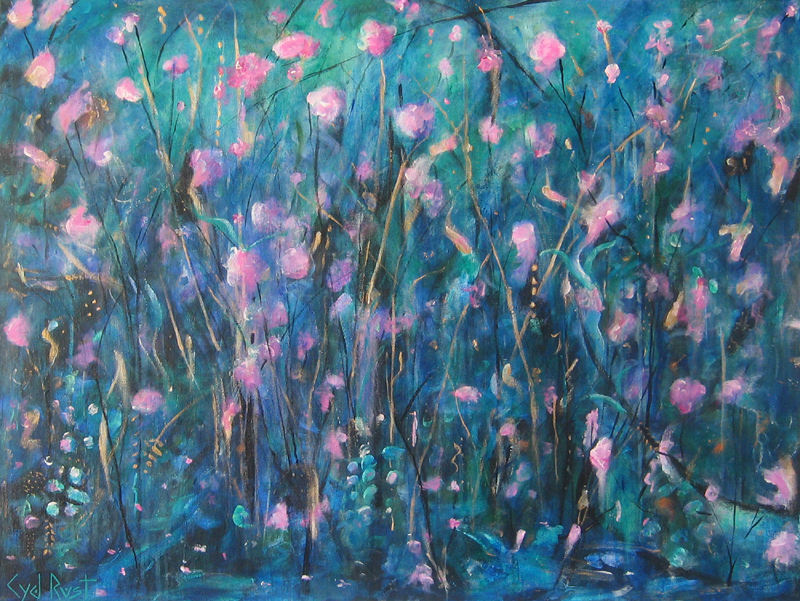 I love the ‘garden” look to this painting,even though it is made with the same strokes and marks as all my other abstract paintings. It just looks like a place fairies would play.Some flying above the other brush strokes, but mostly they are hiding among the “grasses and flowers I think”. WHERE FAIRIES PLAY is the third painting in the FAIRY Series.